Instead of styling himself in a way that compliments his 5'7" frame, McCain repeatedly dresses for defeat, sporting styles and outfits that accentuate his short stature. There has not been a President in The White House who has stood shorter than 5'8" since President McKinley took office in 1897. At 5'7" John McCain is up against more than just 6'3" Barack Obama, he's up against an American population that has consistently demanded that their guy be the bigger guy. Does McCain seem to care that 10 of the last 15 elections were taken by a taller candidate? His dress sense indicates not. Instead of styling himself in a way that compliments his height, McCain repeatedly dresses for defeat, sporting styles and outfits that accentuate his short stature. Had he been campaigning in the era before the ubiquity of television he might have better luck. 11 of our first 25 Presidents were under 5'8", whereas zero of the remaining 17 have stood shorter than 5'9". While the camera may be reputed to add 10lbs, McCain and his style team seems to be banking on the fact that it will also add several inches. With his oversized suits, grandfatherly sweaters and shirts that swim around his sleeves McCain's sartorial blunders are often magnified by his impeccably styled wife Cindy, who does dress like she belongs in The White House. Look at any un-posed long shot of McCain and his entourage. Can you find him? No. Try looking for Cindy first, then for him in proximity. In a world dominated by visual images, McCain has the fortunate opportunity to have what every shorter actor wants on camera... a female costar that can make him look taller. 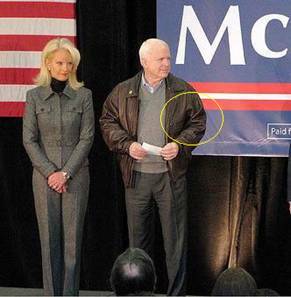 McCain can look at least 5'9" standing next to his lovely wife, if dressed in the right wardrobe. However, all too often it just looks like he's trying to ride her coattails into the White House. 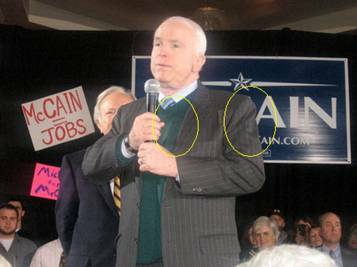 With all that said, it's easy to criticize generalities, so below I have provided a spotters guide to McCain's fashion faux pas. Enjoy. Most of his shirts fit like this--and they're all too big. The shoulders are too wide, the body is too big and the sleeves are too full. It makes him look smaller and sickly like he's lost too much weight. 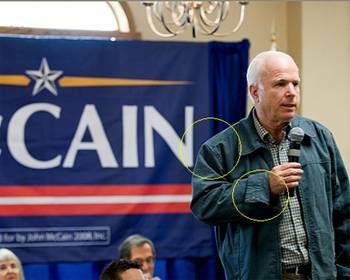 John's McCain's jackets tend to be too big. It's unlikely it's because he needs it for his gut. They're just poor choices. The shoulders are too big and the sleeves are way too long. Look at how his sleeves are folded just to have it at the right length. The shoulders on this suit are too wide, making him look smaller, and his sweaters make him look like a grandfather, not a presidential candidate. The sweater says "I need to keep my old bones warm, even in the dead heat of summer." If he's truly in need of a little warmth, a 3-piece suit would be a better choice. He can stay warm and still look more presidential. A vest is a much better option. John McCain's suit jackets are too long. He clearly should be wearing a short size, not a regular size. The longer jacket and lower button stance is too low for his frame. Not to mention the jacket is still too wide in the shoulders. A more suitable cut for his frame and stature would be more of a trimmer fit. It would elongate his body and make him look taller and a trimmer cut would also make him not look so stout. 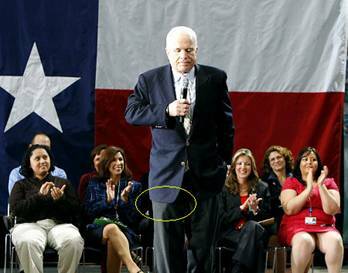 A man can be short and proportioned, but McCain's clothes currently do not reflect that. John McCain can also find better fitting casual wear that won't make him look so wide. 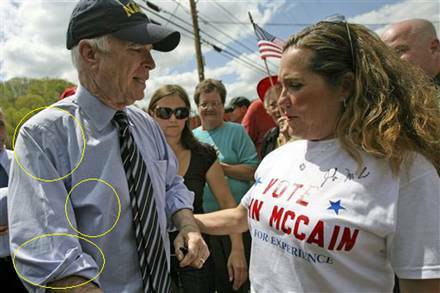 Beyond the fact that McCain eeds to dress sharper because he's the shorter candidate, he also needs to step it up because he has a beautiful slender wife. Until he dresses better, she steals every shot they are in together. After all, they should look like the first couple already. She already looks like the first lady. Alan Au is Marketing Director & Vice President of Jimmy Au's for Men 5' 8" and Under in Beverly Hills, California.